It is now 6:58 PM PT Time on Wednesday, April 24, 2019. Currently there are 98 entrants. Come swim the 2017 USMS Open Water Nationals swim this year at the LAST GASP OF SUMMER! This year we will be offering an Elite swim with all of the USMS Open Water National requirements to prepare for next year’s event. CHECK-IN: Elite Mile check-in will open at 8:00 am. 1 and 2 Mile check-in will open at 8:30 am. No late check-ins will be allowed. TIME LIMIT: Swimmers who cannot swim 1 Mile in 30 minutes should not sign up for the ‘Elite Mile’ Swim. ELIGIBILITY: Open to all 2016 registered Masters swimmers (USMS or MSC) 18 and above as of Sept 17th, 2016. Competitors not registered may sign up for a $10 One-Event USMS registration. Non-PNA USMS registered swimmers must submit a copy of their 2016 registration card to the race registrar. RULES: Current USMS rules will govern this event. The use of neoprene wet suits or other nonporous attire is allowed. No additional devices to help speed, pace, buoyancy, or endurance are allowed (such as webbed gloves, fins, snorkels, etc.). Elite 1 Mile Swim – no wetsuits allowed. AWARDS: Participation gift for all swimmers. 1st place award to top men and women finishers in each age group in each event (1 mile no wetsuit, 1 mile wetsuit, 2 mile no wetsuit and 2 mile wetsuit). Overall award to man and woman in each event. If you swim one event, pay regular price. If you swim two events (Elite 1 Mile and either the 1 or 2 Mile), $20.00 extra. PAPER ENTRIES: 1 and 2 Mile Swims day of the race only. No Elite 1 Mile Swim day of race entries allowed. RESULTS: Posted onsite after the race. 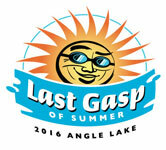 Available online within a few hours on website http://www.LastGaspofSummer.com/results.aspx. DIRECTIONS: From I-5: Take the South 188th St exit (#152); drive west 1 mile; turn left onto International Blvd (aka Pacific Highway South); drive south .5 miles; turn left on South 195th St into the park. Plenty of free parking. Online Registration closed on 9/15/2016.